I can't say anything with complete certainty, but many, if not all, great nations and societies have some form of instructive hero to teach their children basic moral and political lessons. For the Roman Empire, there was Aeneas; for the modern religious west, there is Jesus Christ; for modern China, there is Léi Fēng. The first two are likely familiar to anyone who was born in the west and has received formal classical education, while the latter is almost certainly unfamiliar. Before I explain who Léi Fēng is, I want to discuss the importance of instructive heroes for societies generally. This wont be a full philosophical treatise on the necessity of moral and political education for a healthy society, and the topic itself will be revisited time and again over the course of my writing. In the most general terms, a society is only as strong as its body politic. When considering the health of a society, one of the key indicators of societal sickness is political disengagement by the citizens. I use citizens here to refer specifically to that class of people within a society that have the ability to determine the outcome of events on a local or national level - so for the Romans, this would have originally only encompassed the elite aristocratic caste and eventually included the plebeians, while for America it originally only encompassed white property and horse owning people and has come to encompass all people who are over the age of eighteen and fit the current requirements for citizenship. In a society like modern China, the group of people that actually have a say in the national or local governance is substantially smaller, as a percentage of total population, than either of these two societies once they loosened their citizenship requirements. I will go ahead and respond to any complaints about historicity when describing the foundational myths of America and the Roman Empire by asking you to bear with me - what I miss in historical substance I will try to make up for with moral and political teaching. The picture above would stir the heart of any good Roman citizen. 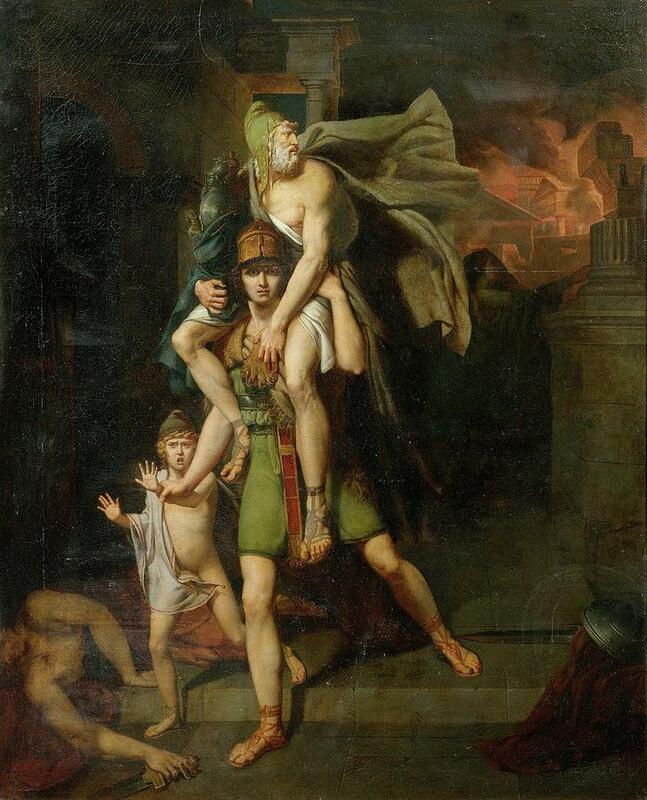 Pictured is Aeneas, fleeing the forsaken city of Troy after the Danaan forces had overrun the interior thanks to the cunning of Odysseus. On his back he carries his father and the household god, and he holds the hand of his young son. Aeneas, through many trials and tribulations, would go on to settle the land that would eventually come to be known as Rome, having been established by Aeneas' descendant Romulus. Aeneas typified the perfect proto-Roman: he was concerned with the well-being of his family, his state, and his gods. There is a Roman concept that encompasses this mentality - pietas. This word is badly translated into English in almost all of its forms, but can be understood when seeing a few of the possibilities together: filial piety, duty, religiosity, devotion. Aeneas so fully encompassed these virtues that he is very frequently referred to as Pius Aeneas. This is not an accident, as the book where Aeneas is described (aptly named the Aeneid) was written far after the events described would have taken place by a man named Virgil. Virgil was hired by Emperor Augustus to write the work, both in order to establish the legitimacy of his family as rulers and to mythologize the essential Roman virtues in a foundational character. When children were too young to understand why they ought to be good rather than bad in their daily life, they were already hearing the stories of Aeneas saving his family and household gods from the destruction of Troy. Good Romans were expected to conduct themselves according to pietas, and the story of Aeneas only served to further this behavior. Three spheres of Roman life are encapsulated in this one word: the family, the state, and the gods. For those uninitiated in the mystical history of Rome, this is a good way to begin understanding them from a moral standpoint. Familial piety was prized highly, as was the duty one has to the state, both in terms of civilian respect for governance and military service. 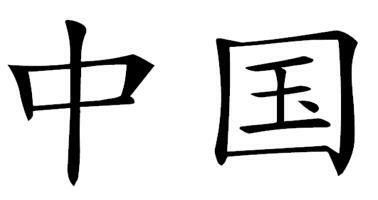 Pietas can be connected to the Confucian virtue xiào (孝). Xiào, in essence, can be understood as the Confucian virtue of filial piety. For a better understanding of this particular virtue, I'll quote a bit from an English translation of a famous, old Confucian text called Èrshísì Xiào (literally, twenty-four filial piety, but translated more poetically as the Twenty-four Exemplars of Filial Piety). In the text, twenty-four short stories are given to establish the conduct expected of a child with regards to their parents. I've selected one in particular - a story about a boy stealing oranges - for good reason: it highlights some cultural differences between Chinese and Western (Christian) understandings of morality pretty well. The following is a translation of the text cribbed from this link. In the Later Han Period, a young boy of only six years old showed a deep filial regard for his mother. He traveled with his father to visit the Chief Minister of Nan Yang, named Yuan Shu. Elder Yuan Shu saw how precocious the young boy was, and ordered his butler to bring a dish of oranges to offer to young Lu Ji. The boy saw the delicious, large fruit, and immediately ate two . He waited until nobody was looking, and secreted three oranges away in the sleeve of his robe. When it was time to say good-bye, along with his father, little Lu Ji raised his hands up in salute. Unexpectedly, the three oranges came rolling out, and fell to the floor in front of Lu Ji. Yuan Shu saw the oranges and laughed: "Little Brother, you're my guest today. How come you stole your host's oranges?" The little boy replied, "Pardon me, my mother likes oranges best of all. Because we don't have any money, it's hard to provide oranges for her. Today I enjoyed two of these ripe, sweet, oranges, and I could not resist taking a few of them back for Mother. She likes them so much." Minister Yuan Shu was impressed by the six-year-old's concern for his mother's happiness. He told his staff to give the entire plate of fruit to Lu Ji for his family. Most rare in a boy just six years old. Just a token to repay her kindness without end. If you grew up in the west and lived with the unavoidable influence of Christian moral teaching (it's still there in predominately atheist societies, whether you believe it or not) then this story might be striking in its seeming non-judgement on the act of thievery. While it was noted and joked about by the minister, once he learned that the young boy meant to bring the oranges to his mother all was forgiven - in fact, he was rewarded for this act. If you're interested in understanding filial piety, the Èrshísì Xiào is a great place to start. The focus on xiào here was twofold: I enjoy highlighting the similarities and the differences between cultures, and I think xiào does a fairly good job at this for westerners. The further connection between pietas and xiào can be had in the extension of the familial piety (which is, as stated, the generally accepted English translation of xiào) to the state. 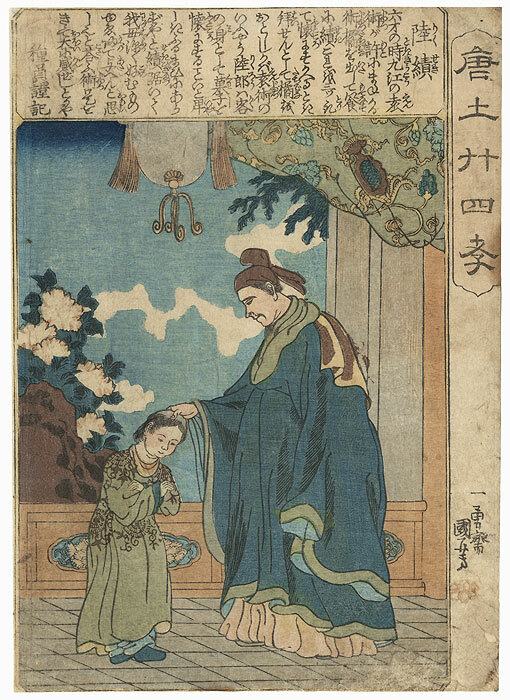 In the Xiaojing, or the Classic of Filial Piety, of Confucius, the connection between filial piety and piety to the ruler is made explicitly clear. Here's a link to a translation of that text that can be accessed alongside the traditional Chinese. As one can see, there's a definite through-line between these two separate old-world concepts of pietas and xiào. Throughout all of history and in all places, children have been raised to act properly through stories. In ancient and modern China, stories describing xiào are still known widely among the general population. 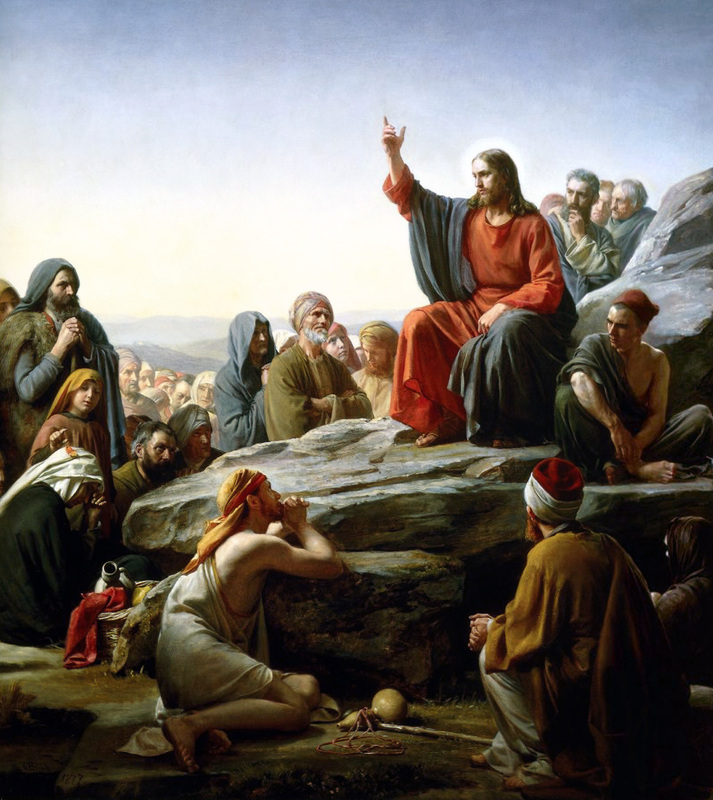 In America, where a majority of the population identifies as Christian, the parables of Christ are taught and known widely among virtually everyone. The degree to which the stories are studied in a scholarly setting is an interesting datapoint to consider, but the fact of the diffusion of such stories among the population is undeniable. Children have historically been believed to be incapable of moral judgement or reason more generally. Aristotle goes so far as to frequently name the two populations most incapable of moral judgement or action as children and brutes. This idea, popular in many cultures throughout the world, might be totally wrong (see this 2009 study on how children appear to consider intention when judging the morality of actions), influences the way that people have raised their children throughout all of recorded history. Often, believing children incapable of understanding "simple" concepts such as right and wrong, stories are told to ingrain the moral lessons a society believes necessary for their continued success. This, when implemented across a population, gives a shared understanding of morality that allows a shared understanding of how to exist within the world. In turn, this shared understanding of how to exist in the world promotes unity and stability among the people of a given place, region, or country. If all children of a place are taught the same virtues - be it pietas, xiào, or Christian goodness - you will ensure that an entire generation looks at the world through a similar lens. 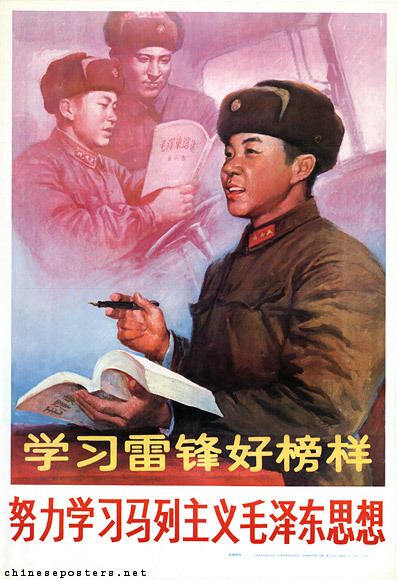 The above poster can be translated like this (thanks, partner): "Learn from Léi Fēng, the good role model - study hard the Marx-Leninism and Mao Thought." Now, we will talk about who Léi Fēng was and why he's both cool to know about and can be used as a lens to understand a particular period of Chinese thinking. We will first talk about what place he has in modern China from the perspective of a child living in the People's Republic of China. If you're a young person in China, you learn about Léi Fēng in Chinese class. He is always referred to as a real, historical figure. Born on December 18, 1940 in Wangcheng (the old capital of the Eastern Zhou Dynasty), Léi Fēng had one of the worst early childhoods imaginable. According to a documentary put together for the state-owned and state-run China Network Television, Léi Fēng lost all of his family in ways that set him up to be the perfect Communist Party of China posterboy. His father, was killed by invading Japanese when Léi Fēng was only five, his older brother died because of child labor exploitation, and his mother committed suicide after being dishonored by a landlord. 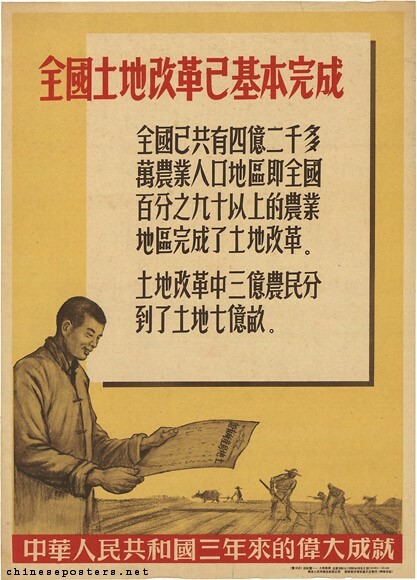 Léi Fēng, perhaps spurred forward by the wrongs committed to his family by landlords, corrupt business owners, and the Japanese, joined up with a communist youth corps at a very young age. 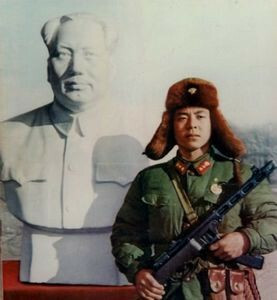 He would later join the People's Liberation Army at twenty, and only two years later he would die in an unfortunate accident where he was crushed by a pole. People who are too arrogant are ignorant. He doesn't know his real capabilities. He doesn't realize he is only one drop in the ocean. If you only have the people and not yourself in your heart, you will achieve honor and prestige. I feel that a revolutionary should put the revolution's interest first. Contribute his all for the party's enterprise. It is the happiest thing. Plainly, this orphaned child turned revolutionary was, along with being a devoted believer in Mao Thought and the mission of the party, quite the poetical soul. 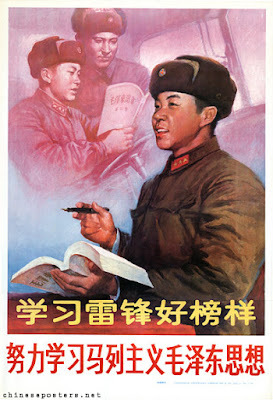 One might rightly suspect that the historicity of Léi Fēng is doubted by many - but it is worth noting that officially, Léi Fēng is recognized as a historical figure by the Communist Party of China and is taught as such to children in schools. In fact, the importance of Léi Fēng is further enshrined by the national holiday Xué Léi Fēng Rì (Learn From Léi Fēng Day), where schools and groups across China take part in community service in the style that the folk hero was supposed to have done. It should be noted that recently, interest in Léi Fēng has diminished and skepticism about him has grown, though mostly in the chorus of those already critical of the Communist Party of China. Léi Fēng is a tool to instruct the populace how to behave rightly, as Aeneas was for the Roman Empire. Not unlike Aeneas, the person of Léi Fēng is debatable, and the figures have both been propagated by a ruling class looking to instill virtues favorable to themselves and the smooth running of society under their control. The lessons of Léi Fēng are a sort of extreme filial piety, taken not as merely for the parents themselves but to the entire society as one. The individual is not to be counted above the collective, and the good citizen in China is to be almost stripped of identity sans party. I wanted to write this partly to introduce the west to Léi Fēng as a folk hero of modern China, and partly to wonder out loud whether the west finds itself lacking the same sort of cultural touchstone in modernity. Who do we learn about in primary education - barring Christ for Christians - that instills a sense of moral uprightness or correct political behavior? I don't want it to appear that I am suggesting we need to begin religious education in schools - in fact, I think that would be damaging at this time - but rather to suggest a need for western society to examine its education of children. We largely lack instructive heroes in modernity, which many may find to be a good thing. I can imagine people scoffing at this article, existing in their post-modern and post-structuralist academic worlds, and stating that we need no heroes. Instead, they might suggest, we should examine the evil and wrong that our societies in the west have committed, and teach our children never to commit the same atrocities again. They might say further that western society is not worth saving, and that any attempts to solidify or unify a western world is anathema to post-modern good and evil (good being the other, evil being us). To them I say only this: while the west actively and happily pulls itself limb from limb like some leviathan turned mad, the illiberal world is unifying itself in opposition to us. Before you blindly accept that the illiberal world is consummately better for merely being other, examine their societies. Examine what they value - for example, the ablation of the individual and the creation of the hive-mind - and weigh it against the taught virtues of western society. Look at the intention and the actions taken by the west, not merely the acts deemed (or actually) horrible. For some, this is an impossible calculus, and those people are likely destined to intellectual destruction regardless of anything they might read. This is the second part of the series I've begun recently on Chinese history. In this post we'll cover the basics about the Xia. The first thing one needs to know about the Xia is their historicity, or rather their possible lack thereof. While multiple texts including the Records of the Grand Historian and the Bamboo Annals discuss the Xia in detail, there is no definitive archaeological evidence to support the specific existence of a the Xia Dynasty. As will be a common theme in this blog overall, I'm going to weave the ancient and the modern - not to mention blending many different academic and artistic disciplines - in order to paint a full picture of what I wish to discuss at the time. Here I want to introduce you all to a project initiated by the People's Republic of China. In 1996, a team of researchers were tasked with determining the location and dates of the Xia, Shang, and Zhou dynasties. The head of the project, Li Xueqin, is considered a titan in the field of ancient Chinese history and archaeology. Li Xueqin, born in 1933, has experienced China through massive social change. He sits as the Director of the Institute of Sinology at Tsinghua University in Beijing. Having been tasked with discovering the locations and dates for the three earliest Chinese dynasties, he assembled a team of over two hundred multidisciplinary scholars to accomplish the task. The project released preliminary results in 2000. I will present the findings - both dates and locations - below for the non-academic public to enjoy, and will include the traditional chronology as well for comparison. 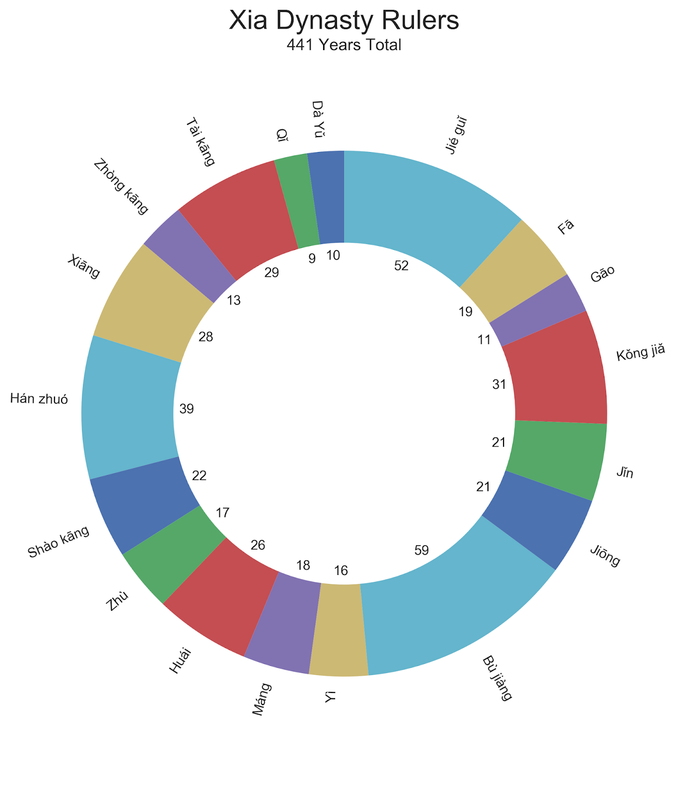 I'll look at the Xia–Shang–Zhou Chronology Project in depth in another post. I've put this together as best I can to show the differences between the two different dating methodologies. I'll go into depth on why they're so vastly different in an upcoming post on the Xia–Shang–Zhou Chronology Project, and dating methodology in general. So, there are a few obvious things that jump out from the comparison between the two systems: first of all, only one includes the named rulers for the dynasty. The traditional chronology is based on books like the Records of the Grand Historian and the Bamboo Annals, both of which go into some depth on the individual rulers of the dynasty and, thus, make for good reading. Interestingly enough, the dynasty receives a different time period based on which of those two books you use, with the Bamboo Annals suggesting an even later start and end date for the Xia. We're showing the date derived from the mystical numerologists exploring the Records of the Grand Historian in the traditional chronology timeline on the left. For transparency's sake, and in lieu of the upcoming post on the dating methods used for the earliest dynasties, it should be noted that the dating for the traditional chronology is not written within these original texts, but calculated later based on small tidbits of information within the stories. the Xia–Shang–Zhou Chronology Project, on the other hand, makes a point of not including any rulers that cannot be verified through archaeological records or something equally convincing to the modern man. The second obvious difference is in time. 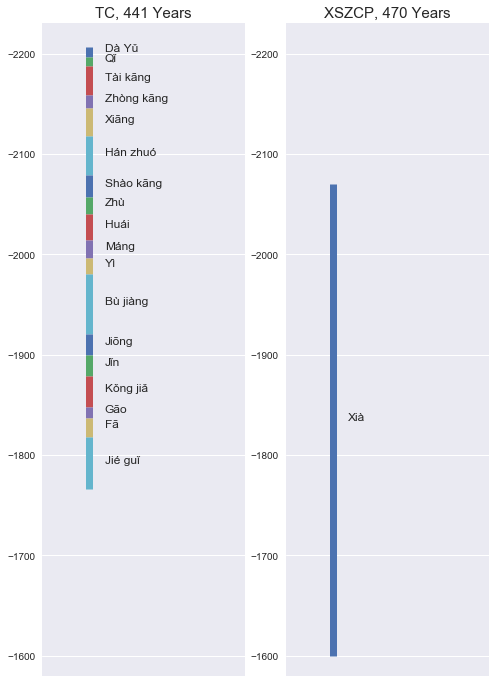 The traditional chronology suggests that the Xia existed from 2207 BC to 1766 BC, while the XSZCP suggests the Xia lasted from 2070 BC to 1600 BC. 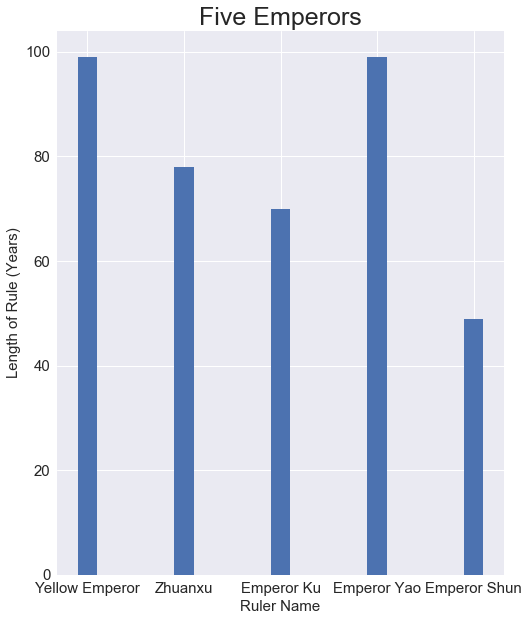 The total year counts are listed in the figure, and its clear that while there is some difference in total length it is not in any real sense substantial. There are some interesting questions one might ask about whether historians and archaeologists should reasonably expect for a timeline to match up that closely in both length and period, but we'll discuss that in the upcoming post. Yu will become important very quickly in our story. The astute reader of visual aids will see that the first emperor of the Xia is named Dà Yǔ. That gives you a sense of where they were in China, which is nice to have. The capital (and general region/size of dynasties) will change hands many times over the course of this series. I'll start including cool geographic data in future posts, as it will be fun to visualize the change over time that China has experienced in what it considered to be the homeland. Now we can move on to the fun part, which is discussing the rulers in some detail. We'll go chronologically using the traditional chronology as our guide, and we'll discuss some fun facts for each ruler as we go along. This will also give a nice overview of what was happening in the Middle Kingdom, and what the people cared about. Without further ado, let's jump into it with Yu the Great. 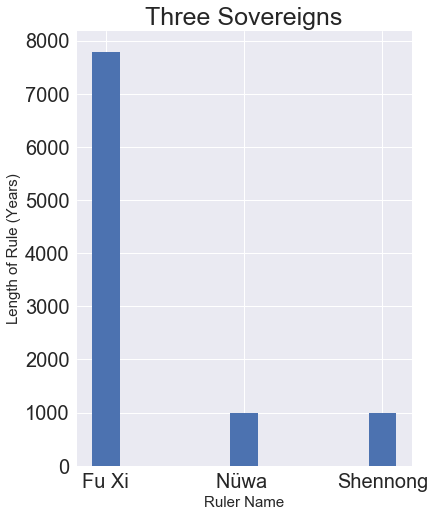 Before we begin, here's another neat visualization of the length of rule for each separate ruler of the Xia - these are broken down into years with the total length of the dynasty, as per the traditional chronology, printed below the dynasty title. We've got a list of eighteen separate people to discuss this time, and not all of them were, apparently, very important. We'll start out with the head honcho, the creator of the Xia, the water-controller - Yu the Great. Dà Yǔ was the first ruler of the Xia. He was minding his own business being the Minister of Works when Emperor Shun called upon him to help solve a problem for the people of Xià: namely, the massive amounts of flooding that were killing off crops and drowning folks. As a fun aside, scientists discovered evidence of massive flooding happening around the time of the legendary Xià dynasty. The evidence, found by a geologist named Wu Qinglong from Nanjing Normal University, was dated to around 1900 BC, which lands towards the last quarter of the traditional chronology or the middle of the XSZCP. This only shows that a big flood did, in fact, occur, but it's always nice when old stories seem to ring true. Yu was quick, earnest, and diligent, not deviating from virtue, kind, and lovable; his word could be depended on, his voice was musical, and his body, like a balance properly adjusted, moved unweariedly and solemnly in accordance with certain fixed rules. That could, viewed from a certain perspective, be describing a kindhearted robot. After he controlled the flooding and allowed things to get back to normal, he came back home. Relating back to something I referred to briefly above, Yu had actually passed his house three times during his infrastructural machinations. Each time, his family begged him to come in and stay with him, but Yu, being virtuous in a distinctly ancient way, refused to see his family until the rest of the country was spared from the floods. Also, if you trust the Bamboo Annals (and who does, honestly), Yu killed a ruler in the north named Fangfeng at the request of Emperor Shun around this time. Gaoyao therefore, respecting Yu's virtues, bade the people carry out as a rule his plan of preferring admonition, but also made use of punishments. Shun's virtues were very clear. What a cool guy. Emperor Shun decided, after all the cool things that Yu had done, that he should be the heir to the throne of Xia. Yu accepted the position, and remembering how level-headed Gaoyao had been in his prior dealings, recommended he be promoted to Minister of Affairs. Gaoyao accepted graciously and then promptly died. From this point on, Yu apparently did very little of note. To be fair, he didn't really need to do much after stopping biblical-level flooding and reforming the penal code for an entire nation, but I am surprised that every single achievement made by Yu was prior to his ascension to the throne. Yu is said to have reigned for ten more years before dying during a routine inspection of the east. Now for the purposes of having a full and fun to use dataset, I'll note that the historical text Yue Jue Shu suggests he died from an illness of some sort. This seems perfectly believable, as Yu spent much of his life bandying about in the muck and water, likely without proper protection from bacterial infection. All told, Yu the Great was a great ruler. Oh, one last thing: Yu created the nine tripod cauldrons, which were very large, from a bunch of metal he was gifted by a loyal subject. These nine tripods were used in ceremonies for a long, long time and are still thought of as culturally important details to Chinese history. As the lord of Hu would not submit, Qi attacked him, and there was a great battle at Han. Just before the engagement the speech at Gan was delivered to the six generals, who were summoned together; Qi said, "Ah! ye who are engaged in my six armies, I have a solemn announcement to make to you. The chief of Hu violently sets at naught the five human relations, and idly casts aside the three obligations of duty. Heaven will on this account oppose him and cut off the span of his life, and I am now but reverently executing the punishment appointed by Heaven. If you on the left do not do your work on the left, and you on the right do not do your work on the right, it will be a disregard of my orders. If you, charioteers, do not observe the rules for the management of your horses, it will be a disregard of my orders. You who obey my orders shall be rewarded in the ancestral temple, but you who disobey my orders shall be slain before the altar of the spirits of the land, and I will destroy both you and your children." He thereupon destroyed the chief of Hu, and the whole nation went to the court of the Prince of Xia. Nice job, Qǐ. He dies, and his son Tài kāng takes over. Zhongkang died, and his son Emperor Xiang came to the throne. Emperor Xiang died, and his Son Shaokang came to the throne. Emperor Shaokang died, and his son Emperor Chu came to the throne. Emperor Chu died, and his son Emperor Huai came the throne. Emperor Huai died, and his Son Emperor Mang came to the throne. Emperor Mang died, and his Son Emperor Xie came to the throne. Emperor Xie died, and his son Emperor Bujiang came to the throne. Emperor Bujiang died, and his brother Emperor Jiong came to the throne. Emperor Jiong died, and his Son Emperor Jin came to the throne. Emperor Jin died, and Emperor Bujiang's son Kongjia, that is Emperor Kongjia, came to the throne. Emperor Kongjia was fond of enquiring into spiritual matters, and indulged in dissipation, and the virtue of the princes of Xia having degenerated, the chiefs rebelled. Heaven sent down two dragons, a male and a female. Kongjia could not feed them, and could not obtain a dragon-keeper. After the decline of Taotang (Yao) one of his descendants, Liu Lei, learnt to train dragons, and he was chosen out of the dragon-keepers to wait on Kongjia, who gave him the title of dragon-tamer, which was inherited by the descendants of the Shiwei. The female dragon died, and he served it up as a meal for the Prince of Xia, but the latter having sent some one to look for it, he became frightened and ran away. Kongjia died, and his son Emperor Gao came to the throne. Emperor Gao died, and his son Emperor Fa came to the throne. Emperor Fa died, and his son Emperor Lu Gui, that is Jie, came to the throne. Regarding the reign of the Emperor Jie, ever since the time of Kongjia the barons had frequently rebelled. Jie of Xia did not strive after virtue, and the wars injured the people. Unable to endure their wrongs they summoned Tang to their aid, but he was imprisoned in the tower of Xia; being afterwards released. Tang cultivated virtue, and the princes all went over to him, so Tang led an army to attack Jie of Xia. Jie fled to Mingtiao, and was eventually driven out and slain. Jie observed to someone, 'I regret that I did not take the opportunity of killing Tang in the tower of Xia, and then I should not have been brought to such a pass.' Tang, being seated on the Imperial throne, superseded Xia, and gave audience to the people. Tang enfeoffed the descendants of the Xias. 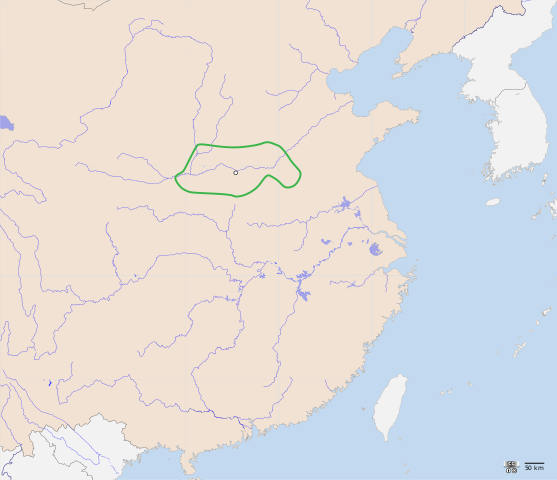 Until the time of the Zhou dynasty they held the principality of Qi. That's about all there is to say regarding the Xia. Most of their legacy stems from the glory of their first ruler, Yu the Great. After his son had a rather successful though arguably terrifying military career, things went downhill fast. As we move into the next post, where I discuss the methodology of the different dating systems in depth, I'll be providing more data and visualizations for your entertainment. For now, that will do for our quick historical account of the Xia. "There is a day called the descent of the frost - Shuāngjiàng... and after that day, bok choy..." She pauses for dramatic effect - "... is no longer tasty."